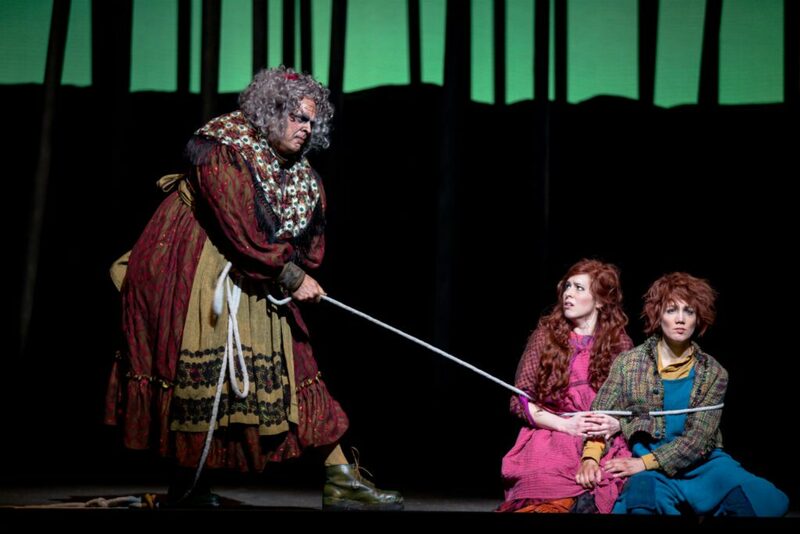 There was a time when ‘opera’ implied a notion of music that unabashedly included the expectation of actual melodies, and Engelbert Humperdinck’s 1893 treatment of the macabre and ultimately triumphant fairy tale Hansel and Gretel is a marvel in that tradition. Edmonton Opera’s in-house production of this perennially programmed opera played up the sweet moments of blithe childhood the title characters enjoy, despite their precarious domestic situation; the fantastical reassurance from the world of fairies and angels, and the grotesque menace that lies in wait deep in the sinister forest. The dress rehearsal that I attended on Jan. 31st at the Jubilee Auditorium, along with hundreds of impressively attentive elementary school children, was enchanting and appropriately ghoulish, thanks largely to lighting and projection designer Barry Steele and some ethereal visual touches from costume designer Deanna Finnman. The opening scene, in which the destitute children amused themselves as they waited for their wretched mother to come home, did a good job in establishing both the family’s desperation and the hungry siblings’ obliviousness to it. Calgary mezzo-soprano Andrea Hill, in her EO debut, possesses a smallish sound, but conveyed Hansel’s mischievous nature well. She is a singer light on her feet. Director Robert Herriot gave the children enough playful stage business to establish character in the opening scene, but some of the singers’ acting felt more stylized than carefree. Toronto-based soprano Lida Szkwarek, who made a strong impression in her 2016 EO debut as Micaëla in Carmen, played Gretel with the right mix of childlike abandon and older-sister ‘maturity’. Szkwarek made a clear, penetrating sound in a big space. She was most impressive when Herriot had her focus on stand-and-deliver singing, and her ability to deliver on that account blossomed as the 1 hour and 45 minute opera unfolded. 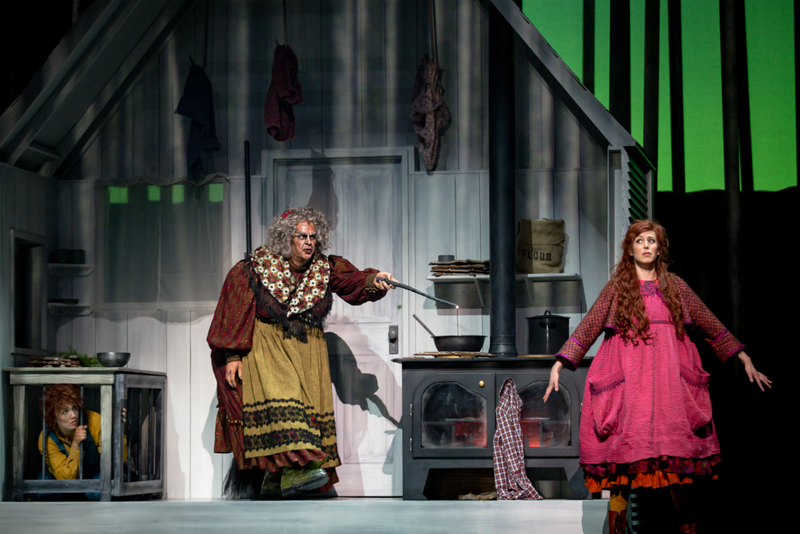 Surprisingly, veteran mezzo Marion Newman was making her company debut in the role of the Mother. She was convincing as the mercurial, woebegone wife of a tippling husband and two spirited kids, shifting from impatient scold to enervated depressive, flopping herself on the bed in her humble shack when despondency and exasperation got the best of her. The Father’s arrival at the end of Act I changed the mood emphatically. Peter McGillivray’s booming baritone commanded the room, and despite his starving wife’s berating, he injected a warm, resilient optimism into the proceedings. When he revealed the bounty he’d returned with to feed the family, his wife’s easy forgiveness for his vaguely intoxicated state seemed heartfelt and theatrically genuine. His anger in learning his wife had chased the kids into the forest to pick berries was a palpable moment of dramatic tension. 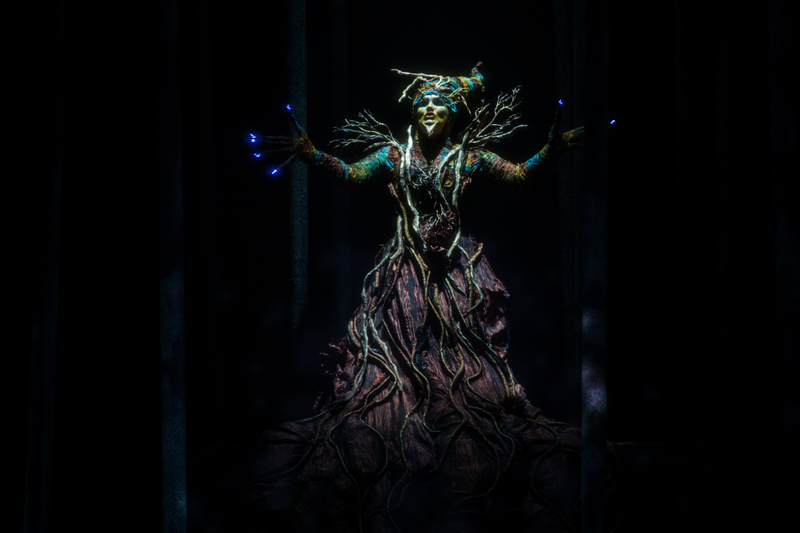 The scenes of enchantment in the forest before the children meet the witch were the most compelling elements of the production. The Sandman and Dew Fairy’s (Edmonton-born mezzo-soprano Aidan Ferguson) costumes were opulent—the twinkling lights Finnman attached to the ends of the Sandman’s fingers sparkled, causing him to ‘hover’ against the black backdrop. This conjured the kind of magic the scene requires, as the children fall into a dreamy sleep before their imminent encounter with their nightmare. Ferguson has a massive instrument, and she used it to good effect in projecting tender authority. The fourteen little angels accompanying the Sandman (members of the Cantilon Choirs) also twinkled, adding a beautiful lull before the enveloping crisis. The young singers also played the emancipated gingerbread children at the end of the opera. Their musical contribution in general was underwhelming, however. They were too faint when singing their ‘echoes’ from backstage, and in the finale—when they should be a vivid part of the happy climax—their effect was strangely subdued. Steele’s lighting and projections had the greatest overall impact on the feel of the production. He created rippling showers of light on the tree trunks to enhance the fairy tale atmosphere, as well as eerie ectoplasmic phantoms, vaguely witch-like, scudding through the forest. The projections also produced a spectacular, confection-covered witch’s house and a horrific immolation for the devious cannibal hag. The hellish demise of the witch was chillingly ferocious. Scenery designer Camellia Koo erected 150 custom-built trees to create a leafless forest. It was a practical way to leave open space through which the singers could project, and to deliver the image of a stark grotesquely cartoonish abominationand dangerous place. 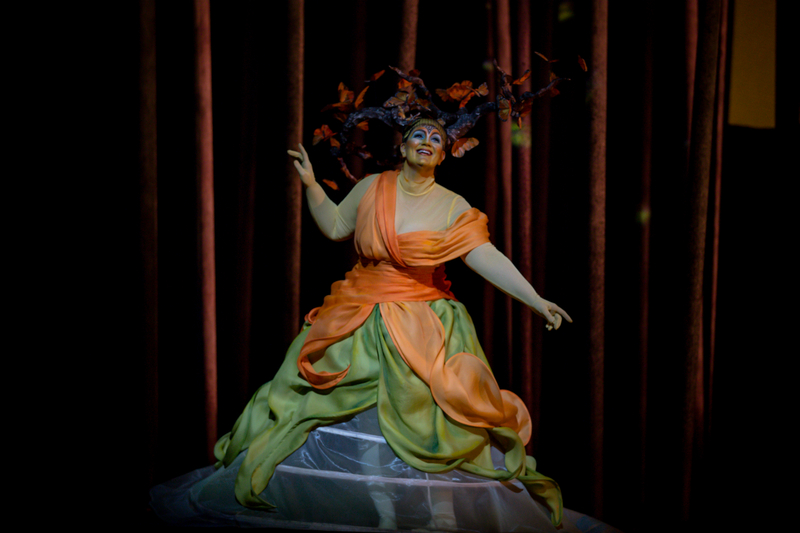 A makeup artist was not identified in the program, but their work, together with Finnman’s costuming, made a grotesquely cartoonish abomination of the production’s witch. Tenor Robert Clark, a six foot three mountain of a man, played the Witch. Clark has become a bit of a local celebrity for his operatic renditions of the national anthems at Edmonton Oiler hockey games. His opera credits thus far in Edmonton and Calgary have been modest; this was his most prominent role, and he gave it his all. His ‘Witch’s Ride’ was animated enough, if a bit lumbering, but he did inject some antic energy into the spotlight moment, and it pleased the young audience. It might have been too ambitious to hoist the hefty crone above the stage for the broomstick ride. That would have brought the house down. I don’t know German, so I can’t say how David Pountney’s translation reflected the original. I do know none of the rhyming reminded me of John Dryden. There was a children’s book kind of silliness to some of his choices, more playful than poetic. The crowd loved it, though, when the witch called Hansel “You poor little booby-head,” and they gave each cast member a roar of approval at the curtain call. The Edmonton Symphony, led by the EO’s Resident Conductor, Peter Dala, underpinned the production with playing that both supported the singers and rendered Humperdinck’s melodious score most pleasurably.